Leading off, Michael Ammar presents an easy-to-master, yet extremely effective, version of MacDonald's Aces while Johnny Thompson offers a take that intimately involves the spectators. John Mendoza is next with the approach of a classicist while Alexander deCova embellishes his interpretation with an amazing – and amazingly simple – four Ace production. Rising card star John Guastaferro offers up two versions. The first features complete vanishes of the Aces rather than a transposition and also supplies a strong presentational hook while the second is the perfect solution for performing this extremely strong card effect for a much larger audience. Lastly, Martin Nash dons his "Charming Cheat" persona and removes the Aces one at a time right from under a spectator's hand. 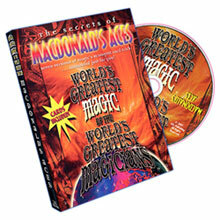 Once again, MacDonald's Aces is one of card magic's rare feats – a genuine jaw-dropping miracle – and on this volume, you'll find seven of the finest treatises ever created.